Miami Heat guard Dwyane Wade apologized Monday to anyone who was offended by his actions before Saturday's Toronto-Miami matchup, when he took a few extra warm-up shots at the beginning of the singing of "O Canada." Dwyane Wade was the first Miami Heat player to line up for the playing of "O Canada" on Monday night. The Heat guard apologized Monday to anyone who was offended by his actions before Saturday's Toronto-Miami matchup, when he took a few extra warm-up shots at the beginning of the singing of "O Canada." Video showed Wade continued his pregame routine for about 20 seconds before he took his spot in line with the rest of his teammates. 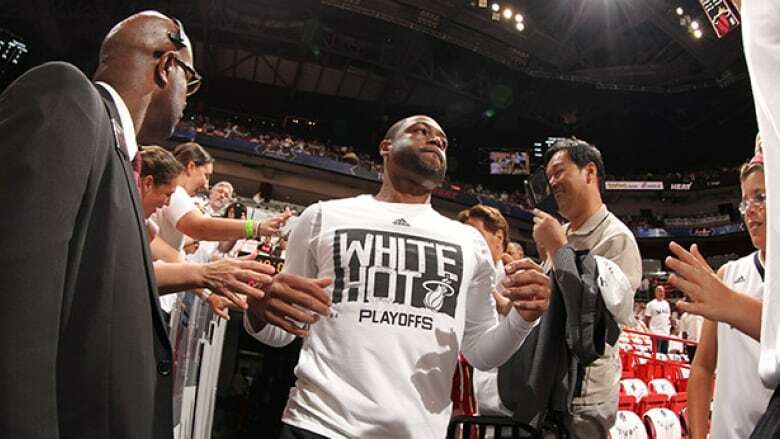 Wade issued the apology after Miami's 94-87 victory that tied the Eastern Conference semifinals. Game 5 is in Toronto on Wednesday. Wade often doesn't line up for the pregame anthem until he makes a certain shot, though during most games in Miami the playing of "The Star-Spangled Banner" is usually preceded by a brief ceremony honouring military personnel — which buys him a few more seconds to line up before the anthem begins. When the Raptors, Canada's only NBA team, come to Miami the anthem schedules are altered to accommodate the length of two songs instead of one. The military ceremony remains in its usual place in the Heat pregame routine. The NBA spoke with the Heat about the matter and asked the team to ensure pregame routines wouldn't interfere with the anthem performances going forward. Some Canadian politicians complained about Wade's perceived slight on Twitter, including Toronto Mayor John Tory.